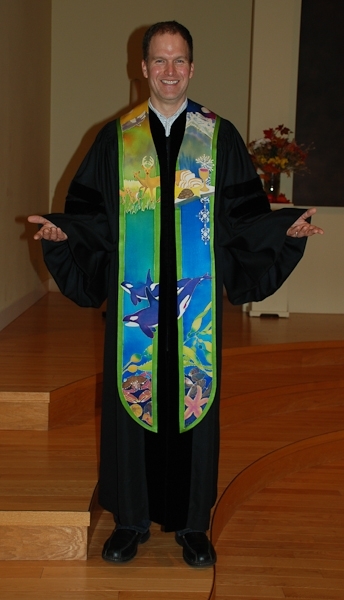 These stoles are designed for liturgical use, for clergy to wear during a worship service. Just finished painting this silk stole top for a pastor in British Columbia, Canada. It’s an older design of mine, the Northwest Green Season Stole, but I get to refine each time I make a new one. I do like this version. Still to do: steam, wash, cut, hand-sew. Fun part is over! 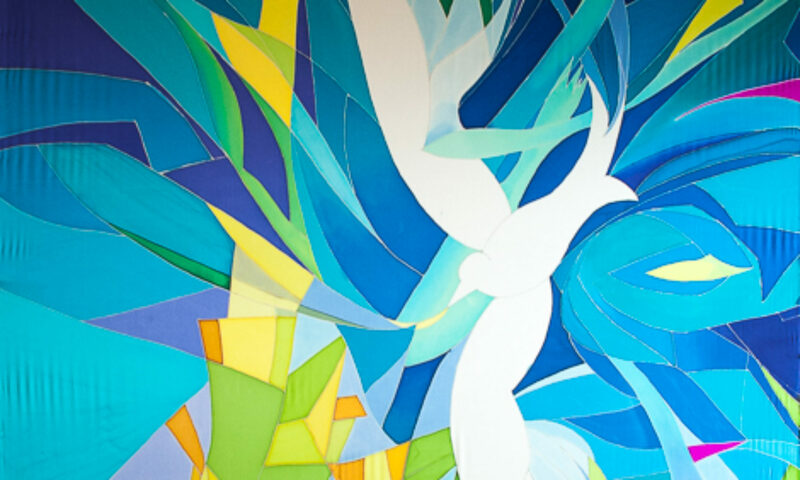 St. Mark’s Lutheran Church by the Narrows (Tacoma, WA) has lots of beautiful art in its sanctuary, including some great stained glass windows. My friend Janet pointed out her favorite part of the glass, a symbol of a dove. She asked me if I could make her a Deacon’s stole with this design on it, transposing the blues to red instead. Stained glass at St. Marks by the Narrows, Tacoma, WA Det. To the left is a photo of the stained glass, which is about 12 feet high, and on the right is my watercolor rendition of the design in reds. I chose to add some purples and spring greens for spark. Janet’s St. Mark’s Dove stole modeled by a Bellingham friend. The next step was to use my red interpretation on a deacon’s stole pattern that I designed several years ago. I found two asymmetrical black buttons in a fancy knitting store to help strengthen the joint between the two sides. Can you see them? I like how the blues and greens and dark black-reds add just enough contrast to the overall red. Janet’s stole modeled by a friend here in Bellingham, showing the side view. Thanks Sharry! This winter I accomplished a long-term goal to develop a stole representing our great Northwest environment. The idea was to include day and night, winter and summer, mountains, plains and ocean in one piece! My goal was to express the sacred beauty and presence of God I experience living in this varied landscape. Wearing this stole in our Green Season rites and rituals in our churches is a way of expressing gratitude to the Creator for such a wonderful home. My hope is to see this sacredness celebrated in our churches. The seed for this stole design came from a painting I completed in 2006, celebrating life at Holden Village in the North Cascades. Can you see in the two vertical strips, one yellow and the other purple, one summer and one winter, the start of the design? ©2006 Kristen Gilje, “Breadmaking at Holden,” watercolor 22 x 30 inches. I promised myself I’d some day make a stole out of this painting, and now here it is!